Internet Explorer has released an update in November’s patches that will block old versions of Silverlight. You can view the list of out-of-date Silverlight versions here. It is showing that everything below (but not including) Silverlight 5.130514.0 will be blocked. This will affect you if you are viewing a Power View Reporting from the web. From the perspective of this blog, we are referring to Power BI via O365. This would also affect Power View reports that are on premise that are run within SharePoint as that would be used with Internet Explorer as well. You see will see the following message within the browser if it detects you are on an older version of Silverlight. The Power View report won’t display without Microsoft Silverlight. 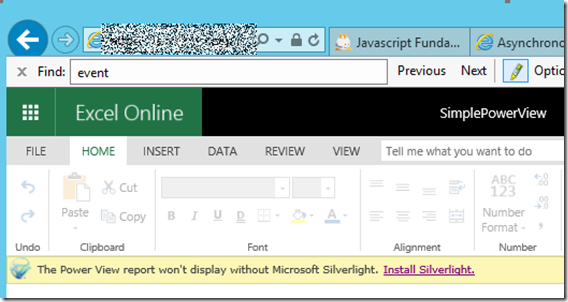 To work around this issue, and continue to use Silverlight, you will need to update the version of Silverlight on your machine. This may mean uninstalling and reinstalling Silverlight. 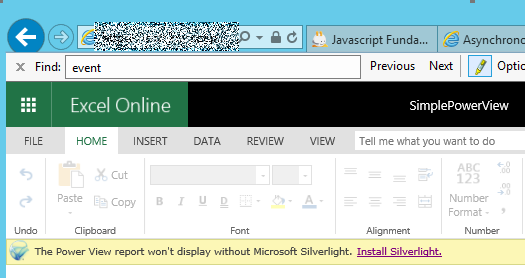 You can get the latest version of Silverlight from http://www.microsoft.com/silverlight/.